The Cherry Orchards usually bloom mid to late May. Stay 3, Take 15 Special (Valid May 2 – June 13, 2019* except May 24 and 25): Spend a minimum of three nights in your choice of six different room types and receive a 15% discount off the regular nightly room rate. Date Night Package (Valid May 8 – June 20, 2019* except May 24 and 25): Slip away for a two-to five-night stay in one of the romantic Signature Rooms at The Ashbrooke in beautiful Door County this spring. This package includes 15% off of the regular nightly room rate, a chilled bottle of Asti upon arrival, and a $50 certificate to Alexander’s Restaurant in Fish Creek. Rates start at $157 per night, plus tax. A Really Suite Deal – Stay & Save Special (Valid year-round *excluding black out dates): Spend three to seven nights in any of our room types and unlock a special rate for the Sunday through Thursday night portion of your stay. Spring Weekday Special (Valid Sunday – Thursday only, April 7 – May 23, 2019): Book 3 nights (Sunday-Thursday) get the 3rd Night Half Off! “Your Cup Runneth Over” Package (Valid with a 2 night stay): This is a perfect package for two! Enjoy a delicious bottle of Door County Peninsula wine in your hotel room; Door County wine tasting for two at Stone’s Throw Winery with complimentary wine glasses; and custom handmade wine cork from North West Designs; plus a $50 gift certificate for a scrumptious gourmet dinner for two at your choice of Pasta Vino or Harbor Fish Market & Grille. Package rate of $80 will be added to reservation. “Taste of Baileys Harbor” Package: This package is guaranteed to help you experience the fun available in Baileys Harbor! Enjoy two flights of beer tasting at Door County Brewery; a $25 gift certificate for Baileys Harbor Cornerstone; a$40 gift certificate at Lakeshore Adventures (options include kayak tour, paddle-boards, charter fishing, jet ski rentals); plus a $25 Gift Certificate from the Door County Visitors Bureau. Package rate of $99 will be added to reservation. Indulgence Package: Enjoy a delicious Door County Chocolate bar and a Beachfront Inn robe then choose between a 60 min massage by Massage of Sister Bay or a 90 min Facial by Bombshell Beauty. New package pricing details to come! * Birchwood Lodge in Sister Bay is located within walking distance of shops, restaurants, bars, recreation, a grocery store and the beach/marina/waterfront park in Sister Bay! We offer some great specials to enhance your visit! Mother’s Day Special (Valid only during May): Bring your mom with you as a guest at the Birchwood Lodge in the month of May and receive a 10% off your total room cost. In order to receive the special pricing, it must be mentioned when making the reservation. 3 Nights Special (Valid thru May 1, 2019): Stay three nights in one of our Premier Suites and one of the week nights is FREE. Stay three nights in any other type of room and one of the week nights is 50% off. Call for details and availability, some restrictions may apply. Door County Half Marathon (Valid May 3-5, 2019): Be our guest during your Door County Half Marathon event and receive a discounted room rate for your stay in a Premier Suite with a king size bed, whirlpool tub, gas fireplace, kitchenette, full bathroom and private deck/balcony. Light continental breakfast is included. Take a shuttle from our lodge to and from the course at no charge. After your run, soak in your in- room whirlpool tub or take advantage of our sauna in the pool area. If you finish in first place overall in the men’s or women’s division, your stay will be on us. Second and third place overall finishers in those divisions will get 50% discount on the room rate. Call for details and availability, some restrictions may apply. Weekend Getaway Special: Stay Friday and Saturday nights in a Premier Suite, Grand Suite or Premier Deluxe Suite and get a $20 Gift Certificate for Champagne Brunch at Alexander’s Restaurant and an in-house baked, pre made Luigi’s 12” Pizza delivered to your room. Special value rates are $218.00 – $398.00 plus tax, depending on the type of the room and the season. Call for details and availability, some restrictions might apply. * Bridgeport Resort in the center of historic Sturgeon Bay offers an array of on-site recreational amenities including indoor/outdoor heated swimming pools with an indoor splash park and playground for the kids, a whirlpool, a sauna, and a fitness center. Rooms and Suites are available. Weekend Package (Valid Jan. 4 – May 18, 2019): Stay in Any Suite and Add Any Package Extra to Your Weekend Reservation and Receive a 10% Discount on Room Rates! Two Night Minimum Stay. Visit Bridgeport Package Extras for options. Mid Week Special (Valid Sunday through Thursday, Jan. 1 – May 23, 2019): *Excludes Holidays and blackout dates. Subject to advance reservations. Stay Four or More Nights – 20% Off Daily Ratesand blackout dates. Subject to advance reservations. Spring Women’s Getaway Weekend (April 26–28, 2019): Friday Night Welcome Reception with Nacho Bar (Gluten Free) 5-7pm; Saturday Women’s Activities including Complimentary Massages and Satin Hands & Lip treatments 9am-5pm, Yoga for women only and Yoga for families, arts & crafts opportunities, and Continental Breakfast Saturday and Sunday! Activity Sign Up Available at Check In. Two Night Package. Nature of Romance Package: We’ll have a warm room waiting with a gift basket of local cheeses, crackers, meats and a bottle of cherry wine. Settle in and get cozy while watching a DVD from our movie library. Let us make arrangements for a private sleigh ride (weather permitting) or scenic Door County Trolley Tour and reservations for dinner for two ($40 value) at one of two fabulous restaurants: The Chop Steakhouse, or The English Inn. We’ll also include a $25 Door County gift certificate. Rates from $249-$489/ for 1 and 2 night packages depending on room selection. Spa Package: Ladies, grab your best guy or your best friend and come unwind! Start your weekend off with a couples massage at The Spa at Sacred Grounds, followed by a short drive or walk to downtown Sister Bay for lunch or dinner ($30 certificate) at Grasse’s Grill. Grasse’s offers a wonderful selection of salads, sandwiches, and entrees and is located only 1 block from the Sister Bay lakefront. Return to the Inn for a relaxing glass of champagne and a soak in our outdoor whirlpool under the pines! Package rates from $469-549. Experience Door County Package for 2: Come to the Coachlite Inn & Suites and explore beautiful Door County! This two night package includes a unique sightseeing tour on a Door County Trolley, tickets to Fish Creek’s drive-in movie theater, a one day pass to explore Peninsula State Park, and a fish boil dinner for two at the Old Post Office in Ephraim. Rates from $369-449. * Country House Resort in Sister Bay offers a quiet, relaxed, adult atmosphere and a perfect place to get away from it all. 46 rooms & suites, most with private, water view balconies, are nestled on 27 secluded, wooded acres on a rolling bluff overlooking the waters of Sister Bay. Rooms and Suites are available. Get Away To Romance Package (Valid Dec. 26, 2018–May 2, 2019): Two Night stay for two in a water-view room or suite with Choice of a two person massage package at The Spa At Sacred Grounds OR a Door County gift basket; a $25 Door County Gift Certificate; and either a Candlelight Dinner for 2 at the White Gull Inn OR Dinner at Alexander’s Restaurant (retail value of $50). Packages begin at $400 and vary with room selection. Cannot be combined with other specials or promotions. *The Spa is open limited days and hours during our Quiet Season. If they are not open or available during your stay, comparable services may be provided by another spa or massage therapist. Spring & Fall Midweek Special with Dinner (Valid May 3-30, 2019, *except May 26): Book Directly with us and Save 10% plus receive a Dinner for Two when Staying Three Nights! Dinner certificate has a retail value of up to $40, and can be used at Alexander’s Restaurant or Sister Bay Bowl. *Also available without dinner option. Advanced reservations are required. Check for blackout dates. Spring Blossom, Dining & Relax Package (Valid May 3-30, 2019): Enjoy two nights lodging in a room or suite. Your choice of dinner for two or Sister Bay Bowl. Both include a retail value of up to $40; Two half-hour massages at The Spa At Sacred Grounds; An arrangement of fresh cut flowers; and a $25 Door County Gift Certificate which may be redeemed at shops, specialty stores, galleries and restaurants throughout Door County. Price varies with room selection and days of the week: Packages starting at$398. April 2019 Special: Reserve a two bedroom/2 bath and receive a gift certificate for Wild Tomato Pizza and Sister Bay Bowl. Special LOW RATES (Valid in April 2019): 1 bedroom suite for $119/night; 2 bedroom suite for $149/night OR Stay in our Bed and Breakfast starting at $99/night. Spring Break Family Package (Valid thru April 30, 2019): Pack up the family and head to Door County for some fun and relaxation! Reserve a two bedroom, two bath suite for two nights and receive a gift card for pizza at The Wild Tomato and games at Sister Bay Bowl. Rates start at $149.00 per night. Mention the Spring Break Family Package when booking. Vow Renewal Package (Valid Nov. 1, 2018 – May 15, 2019): We provide a seasonal bride’s bouquet & groom’s boutonniere, wedding cake for two with dedicated ceremony space and a justice to officiate your ceremony. Luxuriate for two nights in your elegant whirlpool, two way fireplace suite welcomed with a bottle of champagne! Draw your herbal 6’ whirlpool with robes, grains & loofah. Spend your first married days together with treatments at the spa followed by a romantic dinner with included gift certificates. Launch your Wish Lantern over the water anticipating your future together! We’re happy to personalize your honeymoon with a carriage ride, limo service to tour the county, private dinners, or whatever strikes your fancy! 2 Night Minimum Stay. Limit 10 people for ceremony. Egg Harbor Lodge sits atop the bluff overlooking the waters of Green Bay in Egg Harbor. Splash and swim in their outdoor pool or invigorate in the indoor whirlpool. Rooms are available. Stay Two Nights, Get the Third Night Free (Valid May 1 – June 13, 2019) *Except Memorial weekend when you get a 4th night free instead! Ephraim Guest House Condominiums is located in a relaxing, beautifully landscaped setting, just a half-block from the sparkling waters of Eagle Harbor in Ephraim. Save and stay longer with our Spring Special! Spring Special 2019 (Valid April 1 – May 15, 2019): Stay 4 consecutive nights or more and get one of those nights free! CONSTRUCTION SPECIAL (Valid during Door County Half Marathon weekend and Sunday through Thursday May 12-16 and 19-23, 2019): Use the code ROAD19 for a discounted rate of $95 plus tax per night! * Glidden Lodge Beach Resort is located on the shores of Lake Michigan north of Sturgeon Bay and south of Jacksonport near Whitefish Dunes State Park where you can enjoy a variety of outdoor activities. Suites are available. Tranquil Spa Retreat (Valid Jan.1–April 29, 2019 *excluding holiday periods): Saguaro’s Day Spa and Glidden Lodge have teamed up to deliver the most tranquil off-season package yet! Upon arrival you will be presented with a spa certificate ($60 value) for your choice of massage, body wrap, manicure, pedicure, steam therapy, and much more! After pampering yourself at the spa come back to Glidden Lodge and escape to a scenic suite overlooking. Lake Michigan with in-room whirlpool and fireplace to help ease your cares away. Crazy Little Thing Called Love (Valid Jan.1–April 29, 2019 *excluding holiday periods): Wine and roses await your arrival! Whether it’s you and your honey, 2 couples, or your entire family, all sweethearts will enjoy the fabulous accommodations and the included $40 dinner certificate to Donny’s Glidden Lodge Restaurant, voted by the readers of Door County Magazine as having the best setting in all of Door County! Glidden Lodge Winter Fling (Valid Jan.1–April 29, 2019 *excluding holiday periods): Stay three nights for the price of two! It’s that simple. No schedules to meet with nothing but time to totally unwind. Wine Lovers Package (Valid when Fall, Winter, or Spring Rates are in effect – *NOT available June 15–Aug. 18 or Aug. 31-Sept. 2, 2019 and excluding holiday periods): Glidden Lodge has teamed up with some of the BEST wineries Door County has to offer! Upon check-in you will be given $50 worth of gift certificates to be used at one or more of the following: Door Peninsula Winery, Orchard Country Winery, Red Oak Winery and Simon Creek Winery. * Hillside Inn of Door County is located in Ephraim with gorgeous views of the water from private and shared balconies. Rooms and/or cottages are available. Spring Special 2018: Book 3 nights for the price of 2, plus receive $100 in DCVB gift certificates for reservations/stays until April 30! * The Hilltop Inn is located just steps away from downtown Fish Creek, one of the most popular villages in the county. Town-homes are available, and we have a great Spring Package to help you relax! Relaxing Getaway Package (+$20): Relax and enjoy a quiet night in! Package includes 2 Movie rentals, Bag of popcorn, and a Bottle of wine from a Door County Winery. * Homestead Suites is located on Main Street in the heart of Fish Creek. With Peninsula State Park as a backyard, you can practically bike, hike, walk, snowshoe, or ski right from your hotel room or condo door. .
Manager’s Special (Valid November thru April): Stay two nights and get the third night FREE! Park House Offer (Valid November thru April): Stay 3 nights in our New Park House this quiet season and get the 4th night FREE (Sunday-Thursday)! Winter Package (Valid November thru April ): Stay Friday & Saturday nights in a Spruce, Chestnut, Apple or Hawthorne Suite to Receive a $50 Gift Certificate to Alexander’s Restaurant and Relax with a Lautenbach’s Wine & Cheese Basket. Book a 2-night Package at $329, and add a 3rd night for $50! Excludes all holidays, special weekends and festivals. Saturday Night Special (Valid for listed dates and rooms ONLY – Hawthorne, Apple, Willow, Spruce or Chestnut Suites. Valid Dates: April 6, 13, 20, and 27): Stay for one night on any of the following Saturdays this Winter and receive $50 for dining at Alexander’s Restaurant and Continental Breakfast at the Homestead on Sunday. Perfect for date night: Lodging & dining = $179 plus tax. The Inn at Little Sister Hill in Sister Bay offers deluxe one and two bedroom loft suites with full kitchens. Comfort and Relaxation await you in our deluxe suites. Suites are available – book a package to enhance your stay! Putt-Putt Package: A package for the entire family to enjoy! You will receive a two night stay in a one bedroom or two bedroom suite and passes to The Red Putter, a putt-putt course within a half mile of The Inn at Little Sister Hill. Also, during your break from playing putt-putt enjoy a breakfast or lunch at Grasse’s Grill with your $25 gift certificate. Please call for availability and pricing! Romance Package: The Romance Package is available for a two night stay in our cozy one or two bedroom suites. Upon arrival to your room, you will receive a basket of homemade Door County bath salts, soaps, and wonderful massage oils. Enjoy a romantic dinner for two with your $50 gift certificate to the English Inn. When you come back to your suite, light your Door County candle and open your bottle of Door County Romance Wine, which will be waiting for you in your suite. Then you and your loved one can enjoy a complimentary movie of your choice. * Newport Resort in Egg Harbor is located near many of Door County’s shops, restaurants, scenic parks and a variety of attractions, Newport Resort offers one and two bedroom suites featuring whirlpools, fireplaces and kitchens. Easter Weekend Get-A-Way (Valid Easter Weekend April 19-21, 2019): Each Child receives a Easter Basket. Even those young at Heart will have a visit from the Easter Bunny. Join in the JELLY BEAN Counting Contest. Hunt for Easter Eggs on Saturday, April 20, 2019 at 1pm. Romantic Getaway Package: For those looking for a romantic getaway for two in beautiful Door County, in addition to the items listed below, plus, sleep in by extending your check out time by an additional two (2) hours. A gift basket of a bottle of wine or sparkling cider, two wine glasses and abox of chocolates, a bouquet of flowers, a $40 coupon to Chop, Lure, Alexander’s, or The English Inn. You can also add on for an additional cost, the following items and we will make the reservations for you: A 60 minute couples’ massage at Spa Verde; Tickets to a performance at Peninsula Player’s Theatre. Golf Package: Includes a weekday round of golf with cart for two at Peninsula State Park Golf Course; a $25 Door County Gift Certificate; a $40 coupon to Chop, Lure, Alexander’s or The English Inn. We will take care of making all necessary reservations. Dinner and a Play Package: Our dinner and play package includes (2) tickets to a performance at the Peninsula Players Theatre; (2) gourmet box dinners prepared by McEvoy’s Culinaria; a $25 Door County Gift Certificate; a $40 coupon to Chop, Lure, Alexander’s Restaurant, or The English Inn. We will take care of making all the necessary reservations! Family Fun Package: Start your Door County family vacation out right when you book our package you get the following items… Up to four (4) guests can stay in one room without an additional guest charge; Park passes to Peninsula State Park; a $20 coupon to Wild Tomato Wood-Fired Pizza & Grille; a coupon for a round of mini-golf at the Red Putter; a coupon for $50 off the cost of activities at Cave Point Paddle & Pedal or off the cost of a tour at Peninsula State Park Segway Tour. * Open Hearth Lodge in Sister Bay is located on 6.5 acres of scenic Door County open space with landscaped lawn, rural meadows and young forest. Offering King Whirlpool rooms,Premium King Rooms, Lodge Rooms, Deluxe 2 Queens, One-Bedroom Suites, and the Evergreen Suite (perfect for larger groups). Our Winter Special is still available through April! Winter Special (Valid January thru April 2019): 10% off regular rates on a 3 night or longer stay. Must mention at booking. Spring Stay & Play Special (Valid May 5–June 13, 2019): Stay 2 nights and receive a 10% discount on our already low prices during May and early June. Stay 3 nights and receive a 15% discount. Stay 4 or more nights and receive a 20% discount. Not Valid Memorial Weekend. Season of Blossoms Special (Valid May 5–June 13, 2019): Receive a $50 gift certificate to The English Inn in Fish Creek, plus 2 winery tours, and a basket full of goodies. Rates vary, best to call for details, 2-night minimum stay for this special. Pine Grove Resort is located in Ephraim and offers standard rooms and luxury suites with private whirlpool baths and balconies, on a piece of natural, pristine shoreline, and private sand beach. Rooms and Suites are available. 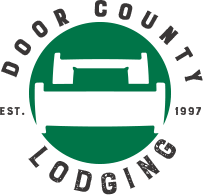 Door County Half Marathon Special (Valid May 3-5, 2019): As a lodging sponsor of the Door County Half Marathon, we are offering all runners and their guests a 10% discount off our 2019 rates during the Half Marathon weekend when booking a minimum two night stay. Guests participating in the marathon will be able to pick up the trolley from our hotel to take them to the beginning of the marathon. Along with this discounted rate we include a special gift bag and free shuttle service to and from our resort to the event. In addition, if any runner staying with us finishes in first place in the overall men’s or women’s division, your stay will be FREE! If any runner staying with us finishes second or third in the men’s or women’s division, we will give you 50% off your stay. Please mention this offer when making your reservation. This offer cannot be given in conjunction with any other discounts. Golf Package: Two night lodgings, a weekday round of golf with cart for two at Peninsula State Park Golf Course; a, $25 Door County Gift Certificate and a $40 dinner Gift Certificate to either Chop, Lure, Alexander’s Restaurant or The English Inn. Dinner and a Play Package: Two night lodgings, two tickets to Peninsula Players Theatre, two gourmet box dinners from McEvoy’s Culinaria, $25.00 Door County Gift Certificate and a $40 dinner Gift Certificate to either Chop, Lure, Alexander’s Restaurant or The English Inn. Package rates depend upon your room selection. Stay 3 Get 1 Free (Valid April 28–June 8, 2019): Stay any 3 continuous nights and receive the 4th night FREE! Senior Discount for persons over 60 and AAA discounts available if staying 2 nights or more. No Discounts on Holiday or Festival Weekends. Spring Special (Valid in April): Enjoy waking to birds chirping out your window and the smell of Door County’s fresh country air when you stay in our Studio, One, or Two Bedroom Condo. This great special is a two, three, or four night getaway, so you can venture out before the crowds come here in the summer. We have bike rentals for your pleasure along with a tennis court and fitness center to get the day going. Starting at $150 for 2 nights in a Romantic Studio! Memorial Weekend Special (Valid weekend of May 27, 2019): Come celebrate Memorial Weekend with a BANG!! Relax in our indoor pool, whirlpool, and sauna, and if you feel courageous, work out in our fitness center too. Enjoy our 3, 4, or 5 night special rate packages in our Romantic Studio, One or Two Bedroom Condos. * The Settlement Courtyard Inn & Lavender Spa, voted #1 Boutique Spa in Wisconsin by Milwaukee Magazine, is located just outside bustling Fish Creek, this is a great spot to begin any adventure, and a great place to relax. Book a Spa Package and relax in Door County! Spa Getaway! (Valid Anytime, some restrictions may apply) Package includes: A stay in a Courtyard Room; 2 Refresher Massages; and Free Continental Breakfast; Add 2 more massage services per person for a 10% discount on those services. Please mention the “Spa Getaway” when reserving this offer. Spring Special (Valid April 4-May 16, 2019): $129/night in a Courtyard Room; any Third night $85. Free Continental Breakfast. Double occupancy. Please mention the “Spring Special” when reserving this offer. Early Summer Special (Valid May 17-June 13, 2019): $149/night in a Courtyard Room. 3rd night $85 when all 3 nights are Sun-Thurs (Excludes Memorial Weekend). Free Continental Breakfast. Double occupancy. Please mention the “Early Summer Special” when reserving. * Stone Harbor Resort in Sturgeon Bay offers rooms and suites with whirlpools, fireplaces, balconies, separate bedrooms, and/or full kitchens, as well as resort amenities including a 21 slip marina, indoor and outdoor pools, Jacuzzi and sauna, a hot tub, free WiFi, business center, on-site dining, and live entertainment nearly every weekend! Don’t miss our Sassy Sisters Weekend! Sassy Sisters Weekend (Valid April 26-28, 2019): Live music, arts and crafts, Martini Making, shopping, dining and more for you and your best gal pals! Rooms from $99 + tax/night. 1 & 2 Bedroom suites also available. Spring Blossoms Package: 2 Nights in a 1 Bedroom Suite with whirlpool and a Door County Gift Basket in your room upon arrival featuring two $25 Gift Certificate for food/beverage in the Stone Harbor Restaurant & Pub, Door County Wine, Cherry Salsa & Chips, Chocolates, Whirlpool Bath Salts. Package Rate $330 for 2 nights.